The iStumbler License is displayed in Preferences. Choose 'Preferences' from the 'iStumbler' menu, then click 'License' in the toolbar. Click the Purchase License... button in iStumbler and the Store Sheet will appear, you can purchase a license directly in the app or via the iStumbler Web Store. As of Release 100.123, if no license is installed, iStumbler will search your Spotlight index for license files and prompt you to install any that it finds while it is running. 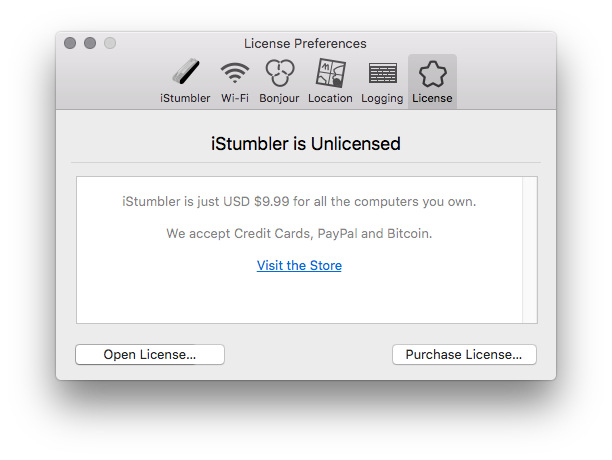 To install your license, first make sure iStumbler is in your Applications folder (Utilities is fine, really anywhere on your computer), then just double click your license file and iStumbler will open and display the license information to you. If double clicking does not work for you, you can drag the license file onto the iStumbler icon, either in your Applications folder or in the Dock, or use the Open License... button. Note that ~/Library is hidden by default on Mac OS, to open it you choose 'Go to Folder...' from the Finder's 'Go' menu and enter the path you want to view. Simply copy your license file from ~/Library/Application Support/iStumbler to /Library/Application Support/iStumbler and all users on the machine will use the license. Note that you will need to create the iStumbler directory if it does not already exist. iStumbler license files are XML Property Lists which include a cryptographic signature which verifies the license information. Changing any value in the plist invalidates the license. You can view the contents of the license file with the the standard system tools on Mac OS.